For many years, Willie’s Tropical Tattoo has been putting on one of the best shows in town twice a year during Bike Week and Biketoberfest. The event is a major “happening” in the Daytona area and there is a huge crowd who show up to participate and show their support for Willie, Tropical Tattoo, Veterans, and The Arni Foundation. 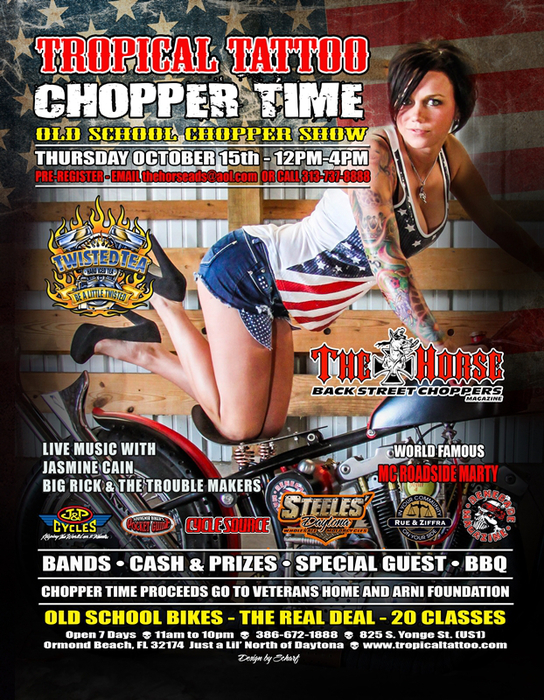 The show is sponsored in part by Horse Backstreet Choppers, Twisted Tea, and Spectra Oils. The show runs from 11 AM - 4 PM and there's beer, girls, bands, trophy’s and awards … not to mention some of the most amazing artwork on the custom bikes … and on the spectators. See a gallery of chopper time Old School Bikes.